We want to use the SpeciesId field to join the two tables together. If you want to try this yourself, you can download this Excel workbook, then import the data from its two worksheets into a new tabular model. As always, SSAS will sort out which way round the relationship should go. 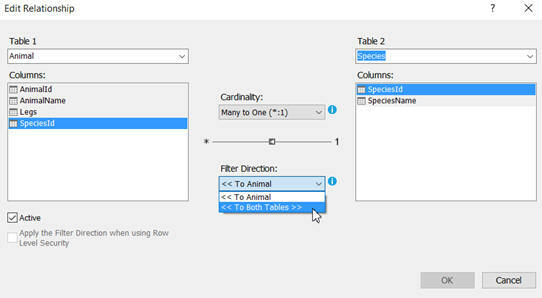 Set the relationship to filter both tables. This is completely normal behaviour: count how many animals (children) there are for each species (parent). Because normally the relationship is only one-way, you'd see something fairly meaningless. There is one species which has no legs, one which has two legs and three which have four legs. The numbers don't add up because crocodiles and snakes have different numbers of legs, but are both reptiles. 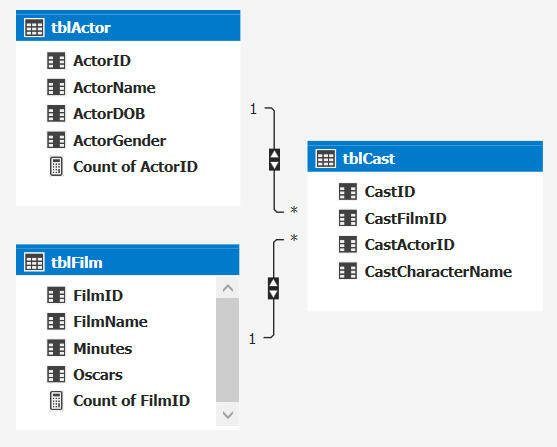 I haven't included the data for this, but the tblCast table links films and actors (it models the fact that one film can contain many actors, but one actor can also appear in many films). Here I've chosen To both tables for each relationship's filter. 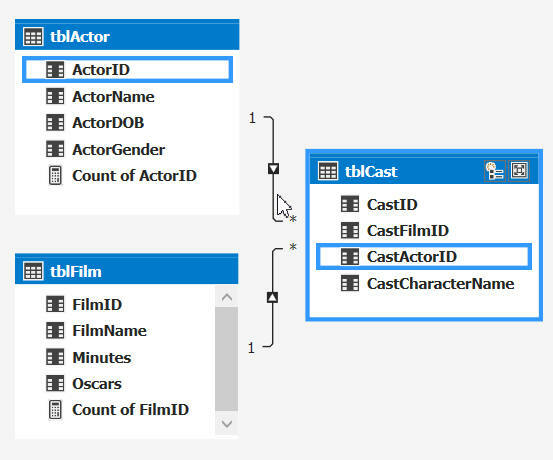 This has saved the messy attempts needed to model many-to-many relationships in SSAS Tabular 2012/2014!